The official first look poster of Malayalam superstar Mohanlal's son Pranav Mohanlal's debut film has been released. The film titled Aadhi is written and directed by Jeethu Joseph of Mohanlal's Drishyam fame. The first look poster features Pranav Mohanlal standing on the edge of a wall in one leg. Sporting a black cardigan and a khaki colur cargo pant, Pranav Mohanlal is seen doing stunt pose with complete ease and a charming smile. 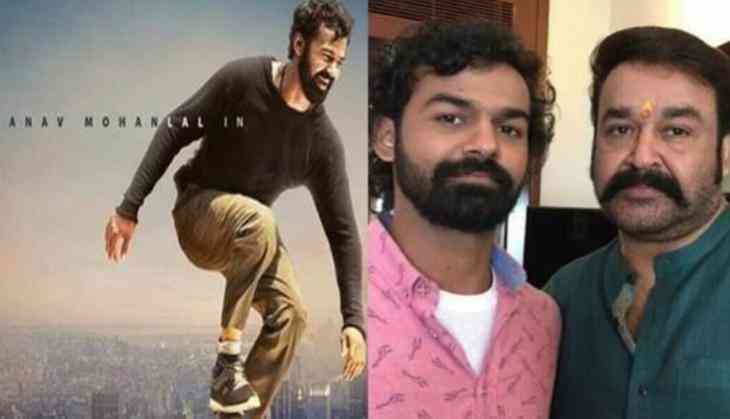 Catch had previously reported that Pranav Mohanlal will be seen doing many parkour stunts in the film and going by the first look poster, audience can confirm they can see many parkour stunts from the Rajavinte Makan in the film. Meanwhile, Aadhi first look posters had gone viral across the social media. Be it Twitter or Facebook, Mohanlal fans are seen busy sharing the first look posters of their idol's son's debut film. The music of the film has been composed by Anil Johnson while Satheesh Kurup cranks the camera. Aadhi has been produced by Antony Perumbavoor under Aashirvad Cinemas.